Gold Jewellery on EMI - Is it a good option? Home » Gold » Gold Jewellery on EMI – Is it a good option? Gold Jewellery on EMI – Is it a good option? Gold Jewellery on EMI – On the auspicious occasion of Diwali many Jewelers and online portals are offering the facility of buying Gold on EMI. They know that Indians are fond of buying yellow metal gold on Diwali. In order to lure customers companies are offering various schemes. Now you need not worry about increasing cost of Gold. You can buy your favorite jewelry on EMI. 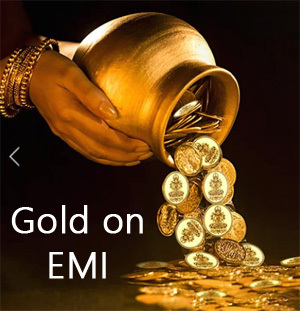 Let’s take a look at How Gold Jewellery on EMI works? How Gold Jewellery on EMI works? It is very simple to buy gold jewellery on EMI. First, you need to select your favorite jewellry. This could be either online or offline. The second step is to select EMI option and down payment. Down payment amount varies based on jewellery type and weight. After that, you need to provide your personal information including address, income proof, and PAN card details. You also need to sign the loan agreement. The company will carry out physical verification preferably at the address mentioned on the loan application. On approval of the loan, you can purchase jewelry on EMI. Also Read – How to calculate Gold Ornament Price? If you are planning to buy gold jewellery on EMI following options are available. Tanishq offers 0% interest EMI option on gold jewellery. In order to avail this offer, you need to visit https://www.caratlane.com. On website of Caratlane, you can have various options such as buy now pay later and EMI scheme. You need to make down payment and processing fees to avail this offer. Kalyan Jewellers also offers facility of buying gold jewellery on EMI. You can avail this offer online on https://www.candere.com. The website offers zero interest, zero processing fee loan. You can have multiple payment option. You can even opt for closing loan earlier. Velvet case website also offers similar facility of buying jewellery on EMI. In order to avail this offer you can login to https://velvetcase.com. Velvet case also offers EMI facility on silver, diamond and platinum jewellery. Another online place for buying gold is – https://emistores.com/. This website even offer of buying other items on EMI. Is it a good option to buy Gold Jewellery on EMI? Consider points given below before taking the decision of buying Gold Jewellery on EMI. Processing Fees – Most of the offers comes with processing fees. The amount of processing fees is 3-4% of jewellery amount. This means you are paying 3-4% extra while buying gold jewellery on EMI. Documentation – You need to provide various document and sign loan agreement for getting approval for this offer. Time – The approval process generally takes 24 hours. This means you need to wait till 24 hours to avail this offer. Physical verification – The process includes step of physical verification at given address. Price of Jewellery – These offers are generally available for the jewellery price above Rs.10000. Down payment – You need to make down payment for availing this loan facility. Limited Cities – These offers are available for the limited cities only. If you are planning to buy physical gold you should take a look at EMI offers given by jewelers. However, I strongly suggest if you have money you should not opt for EMI offers. Instead of buying physical gold, I would recommend buying small units of Gold ETF this diwali. I hope you like this post. Do share your views in the comment section. Don’t forget to like and share this post with your friends.